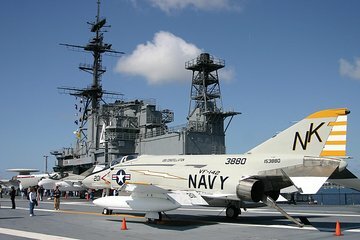 Walk the decks of American naval history with an independent shore excursion to San Diego’s USS Midway Museum. Visit an aircraft carrier that was the world’s largest, and whose career stretched from the end of World War II to Operation Desert Storm. Learn how 4,500 crew members made their home onboard the massive ‘city at sea, ’ and get a glimpse of life below decks. Climb into the cockpit of a fighter plane, see the museum’s vast collection of historic aircraft then take off on a hair-raising flight simulator. This museum is a worthwhile day out. We visited as a shore excursion when our cruise ship docked in San Diego and we weren't disappointed. The size and magnitude of the carrier left us in awe - it was hard to comprehend that a vessel this size could possibly float! The audio tour was great and provided really interesting commentary and facts. We watched a short film in the theatre about the Battle of Midway, which was very emotional but well worth seeing. We really enjoyed being able to climb into the cockpits of some of the planes, which were a lot smaller than we expected! Overall, it's a fun family experience for all ages, as well as being very educational and extremely well presented. Highly recommended! Eigentlich planten wir etwa 2-3 Stunden auf der Midway zu verbringen.... doch das ganze war so interessant und spannend dass es einiges länger dauerte. Die Audiotour darf man nicht verpassen! Eindrücklich. Amazing experience! I wish we would have had more time to explore everything. You need at least 3 hours. It was great knowing a little bit of our heroes' history of the Military. Explore at your own pace. Talk and listen to veterans with experience and knowledge of the Midway add to the overall experience.